I brought Artemisia vulgaris to my land 35 years ago. Having read that it marked the home of the Wise Woman, I thought it imperative to have some. Long ago, I read, when people were not literate, they knew where to find someone because the tools of their trade were in evidence. For the healer, the herbalist, the Wise Woman, Artemisia was the tool of their trade, so it was grown and displayed in front of the house. As populations moved to cities, where it was difficult to grow Artemisia in your (nonexistent) garden, a Wise Woman hung a dried bunch of Artemisia by the door or painted a picture of it on her door. The Artemisias are a large genus of mostly scented plants. If you don't have Artemisia vulgaris growing near you, any of the other scented species will do. For sisters in the desert, that will likely be Artemisia tridentate, sagebrush. For sisters in the orient, that will probably be Artemisia chinensis, which is processed into moxa sticks. 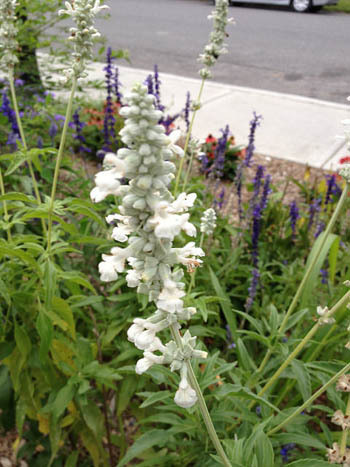 Southernwood (Artemisia abrotanum) and wormwood (Artemisia absinthum) are other commonly-grown scented species. Don't confuse cronewort blossoms with lamb's quarter blossoms. They look alike, but smell very different. Photos of both are at the end of the weed walk. To make your tincture, simply cut the flowering tops of your chosen Artemisia, fill a jar with finely cut pieces of plant, then fill the jar with 100 proof vodka, label, lid and wait six weeks. That will bring us to Halloween, the beginning of winter, and a great time to take your Third Eye Opening Blend. Look for the finish to the recipe then. Meanwhile, let's take a walk in the golden sunshine of autumn and visit the many mints still flowering. I think of mints as the days cool. 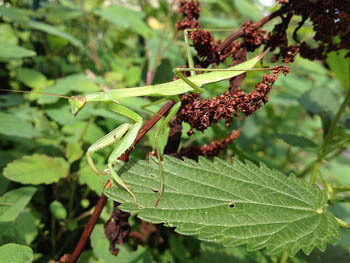 These wonderful plants may be frost-hardy, like sage, or they may die when the temperatures fall, like basil and shiso. Even the hardy ones appreciate a fall pruning, so let's go find some mints to harvest. Be sure to have your vinegar already pasteurized and cool, and a good supply of pourable honey on hand. You may want to tincture a few mints too, so check your supply of 100 proof alcohol. Ready? Let's go. 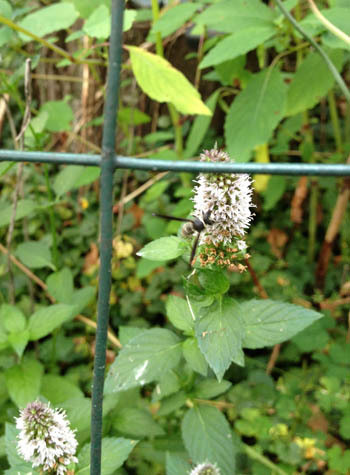 This is the wild spearmint of Woodstock. 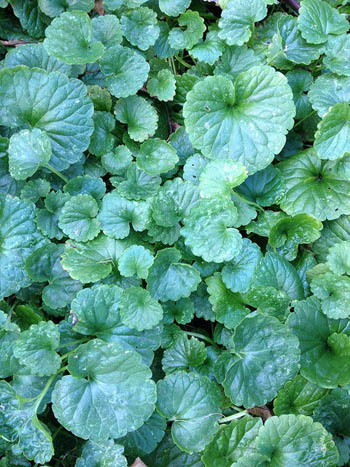 It has very big, light green leaves. I have found it growing in abundance in many places: behind the health food store, on the edge of a pocket forest between two developments, and in Justine's backyard, where I took this photo. 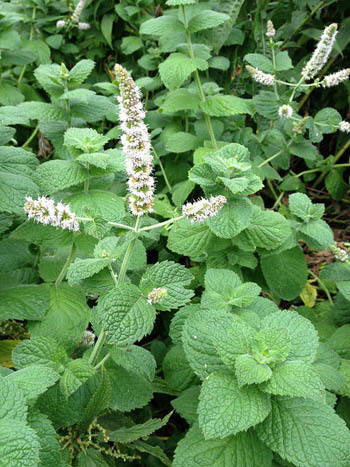 A vinegar or a honey of this light and lively mint is just right. And this is the spearmint that is usually grown, with darker, smaller, unfuzzy leaves. Note that spearmints bloom from the tip while peppermints bloom around the stalk. Notice the long stamens protruding from each blossom. Can you find the wasp in the one photo? I love this as a vinegar or a honey. 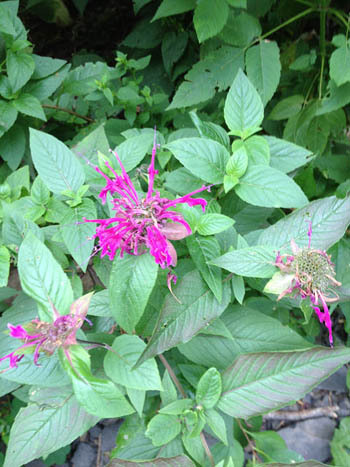 This bright color is the result of cultivation and hybridization. I prefer the wild red and light purple varities, but accepted a cutting of this cultivar and have never been able to convince it that I don't want it to go in my garden. I cut the flowering tops to dry for use in cooking, as a substitute for oregano. Or I make a vinegar of it. 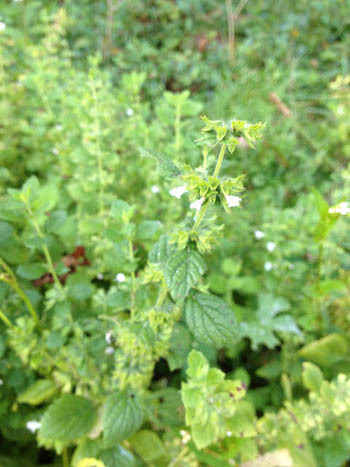 We have cut endless amount of lovely lemon balm from this patch and it is still in flower. Since we have several jars of lemon balm vinegar, it must be time to put up a jar of lemon balm honey. 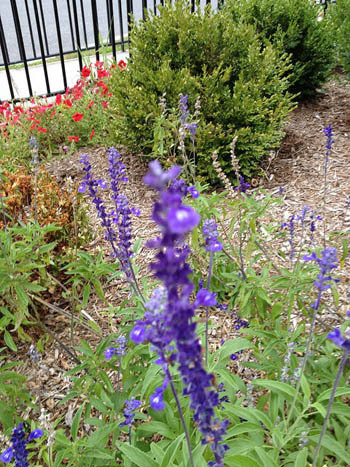 These two mints are probably hybrid salvias, cultivated for their showy and long lasting flowers. Since they are not aromatic, I do not use them for tea, honey, or vinegar. But if I lived nearer to where they are growing, I would be tempted to put some of the flowers in my salad. 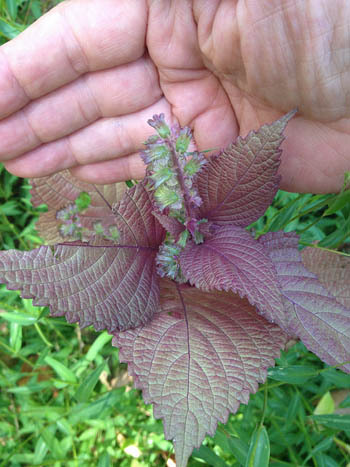 As tender as basil, the shiso must be harvested before frost. That's now! Time to pick bunches to dry. I always make several jars of shiso vinegar to help me stay strong in the winter. I even put away a small bit of shiso honey, though I rarely use it as a tea. 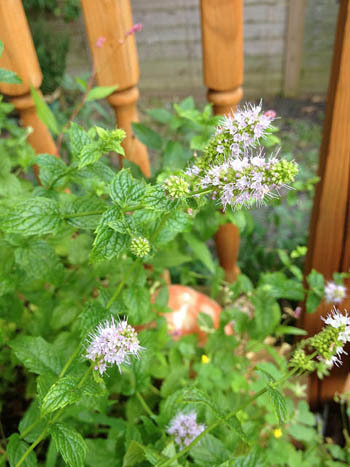 No longer flowering, but in abundance in most gardens and many lawns, even if there is no other mint growing around you, I wager this one is. Like the others, it makes a honey that soothes the throat and a calcium-rich vinegar. And don't forget to use your rosemary, sage, lavender, thyme, and marjoram before the frost.